We have just seen that the ozone concentration can be enhanced even in a VOC-free atmosphere containing oxides of nitrogen and methane—anthropogenic and/or natural—or, to a lesser extent, carbon monoxide. These ozone-producing processes are generally well understood now, and they give reasonable simulations in tropospheric computer modeling. In polluted urban areas, however, chemical reactions of VOCs dominate over those involving methane, leading to considerably more complexity because of the number (hundreds) of VOCs and their diverse chemistry. An excellent review by Atkinson42 covers reactions under tropospheric conditions of several classes of organic compounds, such as hydrocarbons (alkanes, alkenes, alkynes, and aromatics and substituted aromatics) and oxygen- and nitrogen-containing compounds, and their degradation products. Although complete coverage of the photochemical smog mechanism is beyond the scope of this book, this section summarizes some of the more important types of these reactions. 42R. Atkinson, Gas-phase tropospheric chemistry of organic compounds, Monograph no. 2 of The ]ournal of Physical and Chemical Reference Data, J. W. Gallagher, ed. American Chemical Society and the American Institute of Physics for the National Institute of Standards and Technology, Gaithersburg, MD, 1994. 43A coverage in depth of environmental chambers is given in B. J. Finlayson-Pitts and J. N. Pitts Jr., Chemistry of the Upper and Lower Atmosphere: Theory, Experiments, and Applications, Academic Press, San Diego, CA, 2000.
bers, these vessels are often large (from tens to hundreds of cubic meters) receptacles in which reactant mixtures close to actual atmospheric conditions of concentration, pressure, relative humidity and temperature are illuminated with solar spectral distribution light. A typical smog chamber experiment for a mixture of NO, NO2, and hydrocarbon (propene, C3H6) is shown in Figure 5-11. It is seen that the photostationary state projected for a VOC-free atmosphere [equation (5-72)] is destroyed by addition of the hydrocarbon. NO is rapidly oxidized to NO2, O3 is produced after an induction period, and the propene is oxidized to CO, CO2, and a variety of oxygen- and nitrogen-containing organic compounds. This reaction mixture is of course an extreme simplification, containing only one hydrocarbon instead of the hundreds of VOC species emitted into a polluted urban environment. Note, however, that it qualitatively agrees with the actual photochemical smog buildup shown in Figure 5-9. That is, NO is rapidly oxidized to NO2 in the presence of organic compounds (the VOCs emitted along with NO into the atmosphere starting around 6 a .m . from automobile exhausts) and the ozone builds up only after an induction period, during which the concentration of NO is lowered until O3 is no longer destroyed by reaction (5-42). 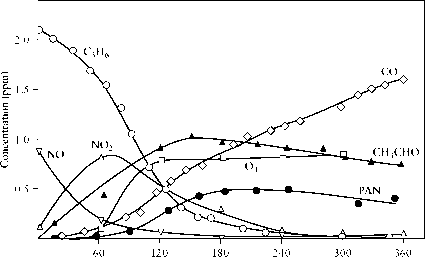 FIGURE 5-11 Typical photochemical smog chamber results for a mixture of hydrocarbon, NO, and air. Drawn from data of A. P. Altshuller, S. L. Kopczynski, W. A. Lonneman, T. L. Baker, and R. L. Slater, Environ. Sci. Technol., 1, 899 (1967); and K. J. Demergian, J. A. Kerr, and J. G. Calvert, The Mechanism of Photochemical Smog Formation, in Advances in Environmental Science and Technology, J. N. Pitts Jr., and R. L. Metcalf, eds., 4, p. 1. Wiley, New York, 1974. Smog chamber studies of hydrocarbon-NO mixtures have shown that addition of aldehydes does indeed enhance NO oxidation and production of secondary pollutants"
For allyl, benzyl, substituted benzyl, or alkyls with more carbons than ethyl, reaction (5-101) is second order under atmospheric conditions (see footnote 40)" The p-hydroxyalkyl radicals formed by the addition of "OH to the alkene double bond [reaction (5-999)] also rapidly add to O2 forming ^-hydroxy-alkylperoxy radicals, RHC(O2)C(OH)HR'"
with reaction (5-103) becoming more important with increasing number of carbon atoms in R.
We thus see that the H02. and R02. radicals generated in an oxygen environment by the .OH radical in the degradation of many VOCs are at least qualitatively the major contributors to the enhanced N0-to-N02 oxidation—and therefore to buildup of 03—in photochemical smog via reactions like (5-102) and chain reactions similar to the methane chain, (5-83). 44For example, with the smallest alkoxy radical, methoxy (H3CO' ), H3CO' + O2 ) H2CO + HO2-. Acyl radicals combine with O2 to form peroxyacyl radicals RC(O)O2"
The simplest and most abundant peroxyacyl nitrate is peroxyacetyl nitrate (PAN), CH3C(O)OONO2. PAN is an important component of photochemical smog. For example, it is highly phytotoxic: one of the most toxic compounds known for vegetation. It is also a potent lachrymator, and is perhaps the major eye irritant in photochemical smog. It is also a greenhouse gas in that it absorbs radiation in the tropospheric IR "window." It is unstable, decomposing thermally by the reverse of reaction (5-111) to the peroxyacetyl radical and NO2; yet it is sufficiently stable in the absence of NO to aid in the transport of nitrogen oxides to initially unpolluted "downwind" areas. In fact, it has been detected even in remote parts of the troposphere. The next most abundant peroxyacyl nitrate is peroxypropionyl nitrate (PPN), C2H5C(O)OONO2; although it may be more phytotoxic, its concentration is only about 10-20% that of PAN. In addition to its key role in the NO-to-NO2 oxidation, the hydroxyl radical is also the primary oxidant and remover of VOCs and other pollutants in the atmosphere. Briefly, its major reactions with VOCs, in addition to those already given are addition, across the carbon-carbon triple bond in alkynes and to the aromatic ring in monocyclic aromatics and in naphthalene and methyl- and dimethyl-substituted naphthalenes, and H-atom abstraction, from ethers, a, ^-unsaturated carbonyls, and alkyl nitrates, and from both the C—H and O—H bonds in alcohols. 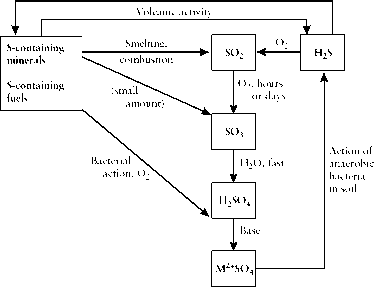 Further oxidation of 'SH leads to sulfur dioxide, SO2. The hydroxyl radical is also involved in the continuing oxidation of SO2 by the addition reaction to form the HOSO2. radical, reaction (5-52), followed by oxidation to sulfuric acid, H2SO4, and sulfate aerosol droplets in the presence of water.45 Large amounts of sulfur oxides are released into the troposphere over industrialized areas, and they become the major acidic component of acid rain (see Section 11.4). While ozone is the major contaminant product and its concentration is taken as the measure of the intensity of photochemical smog, it also contributes to decomposition reaction of the VOCs. For example, the addition of O3 to the double bond in alkenes is a major pathway in their atmospheric decomposition. An energy-rich ozonide is formed, which rapidly decomposes by breaking the C—C single bond and either of the two O—O single bonds to form a carbonyl and a biradical RR'COO\ This energy-rich biradical either decomposes, forming a variety of products including the .OH radical, or reacts with aldehydes, H2O, NO2, and so on. However, although the NOy concentration is greater at night than during the day because of its daytime photolysis, it is nevertheless much less important at nighttime than the .OH radical is during the daytime as a source of alkane decomposition. NOy readily reacts with alkenes by addition to the carboncarbon double bond, followed by rapid addition to O2. The resulting nitratoalkylperoxy radicals can react with HO2. and RO2. radicals, and can also reversibly add NO2 to give the unstable nitratoperoxynitrates, which may serve as temporary "sinks" for the peroxy radicals.